"I love the smell of fear in the newsroom." Superman, like his DC Comics counterpart, Batman, is in the early stages of making a major comeback on the pop culture scene. The TV show Smallville has been on the air since 2001, and a brand new Superman movie is currently in production, with X-Men's Bryan Singer at the helm. Credit the 1990s series, Lois & Clark: The New Adventures of Superman, as an important bridge between the Christopher Reeve movies, and this current Superman renaissance, keeping the interest in the Man of Steel alive and well. This new take on the tale did a great job of capturing the essence of both the comic book and Reeve's movies. However, fans weren't exactly thrilled that much of the series centered on the romantic relationship between Lois Lane (Teri Hatcher) and Clark Kent/Superman (Dean Cain) instead of spending more time depicting Superman battling his various foes. Still, the show was a surprising ratings success, lasting four seasons and keeping the Superman myth in the public eye. Of course, it's a tall order to "re-imagine" any classic characters, let alone those from Superman, but Lois & Clark didn't have any problems pulling it off. Skipping the tired "origin of Superman" storyline was definitely a step in the right direction. Superman's father, Jor-El (David Warner) doesn't even make an appearance until the show's 17th episode, Foundling. The Pilot episode jumped right into things, having us meet the workers at the Daily Planet right along with Clark Kent. Naturally, we also see Clark as Superman for the first time, and discover how he got that name, and from whom. Even though the show was very melodramatic and not a straight-up action show, it did introduce some new villains into Superman lore, while bringing back many of our favorites to take on the Man of Steel. Good old Lex Luthor (John Shea) made the most appearances, and is the central villain in the first season. Superman's new opponents, namely Tempus and one that's a clone of Superman make for nice additions, with the dynamics of our hero fighting himself (the clone) being one of this season's best assets. The most interesting aspect about the role that Lex Luthor plays in this Superman incarnation is his romantic involvement (and obsession) with Lois. This poses an added threat, not only to Superman and the well-being of mankind, but to Clark's future with Lois as well. While Lois is obviously in love with Superman, there is undeniable chemistry between her and Lex, throwing a nice little wrench in the proceedings from time to time, adding a welcome dynamic to the show. There's also the wonderful re-imagining of the Perry White character that actor Lane Smith brings to the show. Smith unearthed a bit of a lighter side of this normally stern character, even dressing up like Elvis in one episode. Mr. Smith recently passed away at the age of 69, and this veteran character actor (he was Joe Pesci's attorney nemesis in My Cousin Vinny) will be sorely missed. Beginning with the 90-minute Pilot, Season One definitely had its share of series-defining episodes. The classic Pheromone, My Lovely is one of the funniest, most heartwarming of the show's entire run. The core of this story, a love potion, has been done many times before, but rarely has it been this entertaining. This being the 11th episode, we know these particular versions of the characters pretty well, so seeing them act completely different under this perfume's spell leads to some truly great material. Throw that in with the emerging love between Lois and Clark, and this is one of the series' most memorable episodes. While that episode, and the Superman-as-bad-guy entry, The Man of Steel Bars, are a couple of the best here, the real standout is the two-part season finale, Barbarians at the Planet and The House of Luthor. These last two episodes center on Lex Luthor's purchase of the financially strapped Daily Planet and the consummation of Lois and Luthor's relationship. After some major staff reshuffling due to the Luthor takeover, Lex proposes to Lois, setting in motion the revelation of Clark's true feelings for her as well. These are fleshed out more in the second part of the finale, The House of Luthor, which ends with some hints of what's to come in Season Two. This isn't a cliffhanger in the truest sense of the word, but it is a catalyst for some changes that occur down the road. The look of Lois & Clark is one of its most captivating qualities. The sets are truly unique and bursting with comic-book-like colors, and most of the location shooting features beautiful landscapes and cityscapes that bring quite a bit of realism to some fantastic sequences. A lack of predictability due to a myriad of writers always kept viewers begging for more as well. You just truly never knew whether you were going to have a serious or sit-com-style story from episode to episode, and the excellent actors never miss a beat, regardless of what they're asked to do. Dean Cain never has, and probably never will be better. He exudes both innocence and brute strength in jumping between his Clark and Superman personas. It's interesting how Cain and Hatcher's careers worked out following Lois & Clark's run. Call it the Superman curse if you want, but Cain has pretty much been wallowing in the mire of direct-to-video and/or cable B-movies. And it took about a decade following the cancellation of Lois & Clark before Teri Hatcher would find her ultimate role, winning a Golden Globe for her work on Desperate Housewives, even though she shows plenty of acting chops here. Hatcher had already gained notoriety in the films The Big Picture, Tango & Cash, and Soapdish, but truly became a household name as everyone's favorite fictional female newspaper reporter. All it takes is one mega hit to revive any actor's career, and it looks like this new TV gem will keep Hatcher's star shining for many years to come. Image Transfer Review: The full-frame transfers for these initial episodes are a major disappointment. The main problems is a soft image, which make the show look much older than it is. A ton of grain shows up, especially in the Pilot episode, and the overall color scheme suffers from muted, bland hues. Still, the nice reds and blues of Superman's costume do look generally bright and vivid, but the other video problems are very distracting. Audio Transfer Review: The Dolby Digital 2.0 audio won't do much to impress, but does feature crystal clear dialogue. The rest of the audio is pretty restricted and these episodes might have benefited by a 5.1 mix. There is enough of a surround presence to add to the action sequences, though, and even some bass creeps into the mix at times. 1 Feature/Episode commentary by Dean Cain, executive producer Deborah Joy LeVine, director Robert Butler. Pilot Presentation: Original presentation reel. Extras Review: While there is a decent amount of extra features spread out among the first and last of these discs, a few more could be included on future sets of the show. We begin with an audio commentary track for the Pilot. This features discussions by Dean Cain, executive producer Deborah Joy LeVine, and director Robert Butler, about the production of not only this episode but the entire first season. Disc 1 also features a Pilot Presentation, which is a 20-minute reel that executive producer Deborah Joy LeVine showed at the San Diego Comic Con. It's very cool to see this footage in a rough format, and amazing to look back on the successful series that this short clip blossomed into. Disc 6 has the rest of the supplements, including the 26-minute documentary, From Rivals to Romance: The Making of Lois & Clark. This piece goes into great detail about how the show came about through interviews with cast and crew members. There's also Taking Flight: The Visual Effects of Lois & Clark, six minutes of how Superman's flying scenes were made to look as realistic as possible. More cast and crew interviews are here, along with some green screen footage. There's also a bonus, seventh DVD packaged along with this set, but in a separate sleeve. This platter is Volume Seven of Warner Home Video's 50-Year Anniversary Commemorative series, and features the premiere episode of the fourth season of Smallville. Presented in anamorphic widescreen, this will whet the appetites of that show's fans until that season makes its DVD debut. 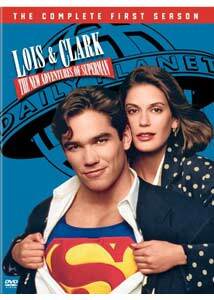 So, here we are, finally, with the release of Lois & Clark: The New Adventures of Superman�The Complete First Season on DVD. It's been many years since the show has even been mentioned, let alone been seen, so its reemergence via DVD is a welcome sight. However, the video transfers are awful, the audio just adequate, and a rather paltry collection of extras that will hopefully be ramped up for future DVD sets of the show.